Advanced medi paste to treat, prevent and eliminate unwanted ingrown hairs! Bump eRaiser Medi Paste has been scientifically formulated to prevent and eliminate ingrown hairs and bumps often associated with hair removal on the face, bikini line, legs and underarms. Containing Tea Tree Oil, Triclosan and Vitamin A, Bump eRaiser Medi Paste reduces swelling and prevents infection of the hair follicle. Built-in moisturisers and exfoliants will leave the skin smooth and soft after hair removal! 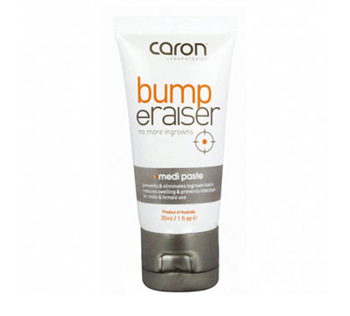 Bump eRaiser Medi Paste should be applied following hair removal. It is suitable for both mild and severe conditions. For male and female use.